This week my computer was attacked by a very sneaky computer virus. It wasn't something easy to get rid of either. It was malware that very cleverly mimics your computer's security system pop-ups and windows. They pop up telling you that your computer has a virus and you need to click on them to fix it. Once the virus gets in and working it pops up more windows every time you open an executable file - which is pretty frequently - and can steal your personal information, photos and files. I'm still not sure *how* I even got it because I didn't click on anything, but that's beside the point, I guess. Luckily I recognized that the wording was not what my security system normally says and that it was asking me to buy or upgrade so I knew something strange was going on. I disconnected from the internet. I hit CTRL-ALT-DEL to bring up the task manager and saw a strange process running that I didn't recognize. I hit delete and it was gone. Yay! Or so I thought...I opened Firefox back up and BAM! A bunch of pop-up windows and alerts all came up telling me that my computer had a virus and I needed to fix it by clicking here right away! Alright, so the virus couldn't be deleted that easily. 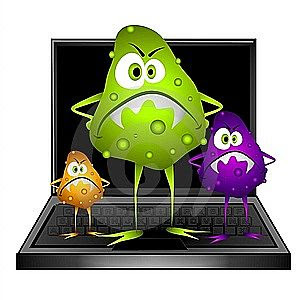 After doing a little searching online I found an extremely helpful website that listed step-by-step directions of how to rid my computer of the virus. I wish getting rid of bad things in my real life were as simple as running a few programs. But I guess there's a life lesson in that. Even though I got it taken care of, it took quite a bit of time to get all of the virus out of my system. It wasn't damaging (other than a lot of time wasted) but it potentially could have been.